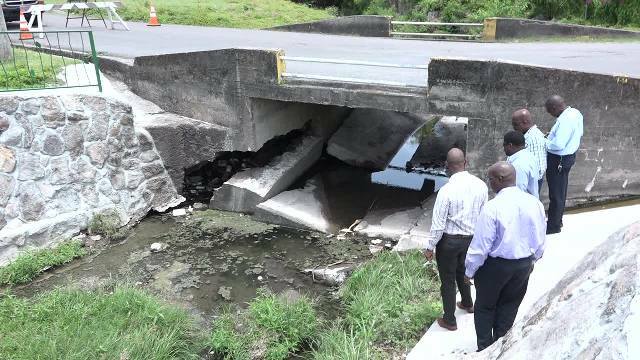 NIA CHARLESTOWN NEVIS (MAY 15, 2017) — The structural failure of critical sections of the Bath Bridge, has pushed officials in the Nevis Island Administration (NIA) to shut it down pending major repairs. Junior Minister in the Ministry of Communication and Works Hon. Troy Liburd, made the disclosure when he visited the area on May 15, 2017, as he alerted the public of the bridge closure. He was accompanied by a team from the Ministry and Public Works Department. “During the next few weeks the traffic through pass will be halted because of the damage to the bridge. The bridge is no longer safe for us to cross. So we are going to stop all traffic across this bridge for the next few weeks,” he said. 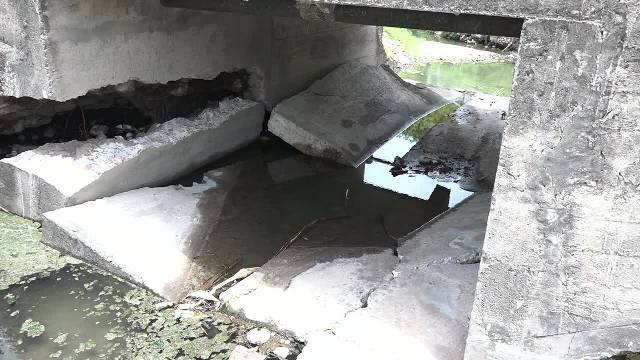 Mr. Liburd blamed last week Thursday’s heavy rains for destabilising the bridge’s structure but assured that the Public Works Department had already engaged in surveys with a view to commence repairs in the shortest time possible. 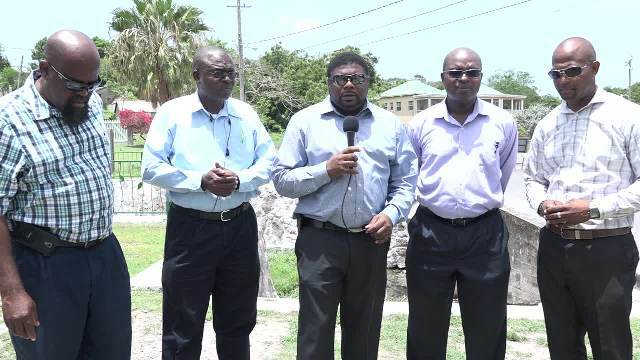 Director of Public Works Raoul Pemberton, in brief comments, shed light on the extent of the damage which he said was due to excessive erosion of the foundation area of the bridge support, mainly in the central area. “On our inspection of the area, we noted that the heavy rains of Thursday exacerbated some of the ongoing issues that we would have had here and they caused the total erosion of the base of the support which is the soil and aggregate below the concrete. “Due to this, the middle section was somewhat suspended and the traffic, over just a day, caused the collapse of the middle section. On the south side we had a total erosion of half of the support,” he said. Pemberton added that the Department had already started its analysis on the best course of action to ensure that the situation could be remedied and they could commence and complete the construction in a timely manner.